A piano can be many things; a tool of the trade, a sentimental family heirloom, a piece of equipment. Yet there are many who see a piano as more than just an instrument, believing it can, and should be, the focus of beautiful home design. st its musical qualities. The shape of the piano provides a contrast of both soft curves and sharp lines, while the polished wood often casts a beautiful light on the room. Because of the graceful design of the piano, more and more homeowners are treating them as works of art and making them a central part of their homes. 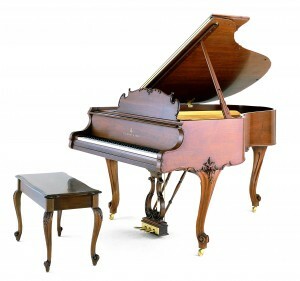 LaBarge Homes, a home improvement and design company based on Cape Cod, recently posted a blog talking about the use of pianos as a design element in a home. It was a response to a mailing that owner Todd LaBarge received from Vivian Handis at M. Steinert & Sons, entitled “Pianos in Art & Design”. Todd provides an excellent perspective of the distinct beauty that a piano can add to a home. They provide a way to fill a large space with an eye-catching centerpiece, and if someone in the home can play (or if the piano is equipped with a self-playing PianoDisc feature) then the piano becomes both a visual centerpiece and dinnertime accompaniment. Though Steinway pianos are often a feast for the eyes, they are known as an instrument that creates a magnificent sound while being a display of masterful craftsmanship. Those who create these pianos are artists, and their art, like any beautiful piece, should be proudly displayed. At M. Steinert & Sons, we’ve long understood the visual value of our pianos, and are always available to help you choose a model that compliments your home décor.